Dhabaleswar Temple is a famous temple in Cuttack which is situated on the shore of River Mahanadi. This temple is dedicated to Lord Shiva and mainly this place is famous for the hanging bridge or in odia this is known as Jhula Polo. This temple is situated at a distance of 37 kilometers from the city of Cuttack and 55 km from Bhubaneswar. The temple, located on the banks of the by the River Mahanadi, is embellished with stone carvings that date back to the early 10th and 11th century. The serene ambiance, in which the temple is situated, inspires a spiritual feeling among one and all. 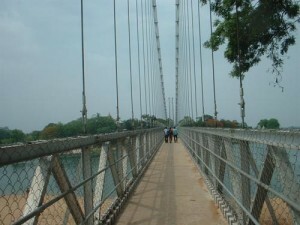 The hanging bridge connects the mainland (Mancheswar) with the island of Dhabaleswar. This bridge is constructed before same year. Before this the devotees used to cross this river ‘Mahanadi’ by boats. You can see a few there in the water. 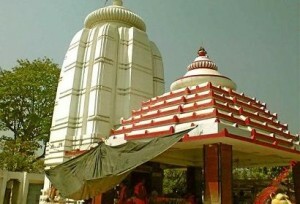 The tourists may travel to the Dhabaleshwar Temple from Cuttack city in hiring cars and buses that ply regularly along this route. Give Responses for "Dhabaleswar Temple of Cuttack"